What is your fitness background: Varsity soccer, rugby, and badminton in university; Nova Scotia provincial rugby team; trail running; boxing; swimming; climbing/mountaineering. What is your training like: I train twice a day Monday, Tuesday, Thursday and Friday in a competitive class and the regular class. Wednesdays and Saturdays are one WOD, and Sundays are rest days. I dance 3-4 times a week and do some trail running/hiking throughout the week. What is your diet/nutrition: Whole foods, mostly plants, not too much (thank you Ben Bergeron!). I have Type 1 Diabetes, so if I’m hungry or low, I eat. I don’t eat sugar or processed foods, I eat 90% organic, and I source as much of my food as locally as possible. I take a number of vitamins/supplements for my Type 1 (Vit. D, E, K, Alpha Lipoic Acid, Low Dose Naltrexone) along with fish oil, Magnesium, Glucosamine, whey protein, and Casein before bed. What are your goals: To be fit and strong enough to climb mountains, surf, swim, play soccer, paddle, dance, and run at age 80; to make top 200 in the Open in Western Canada; to continue competing and go to Regionals as a Masters athlete (team or individual). What do you do outside the gym: I am an educational developer and facilitator, and an MEd graduate student in Multidisciplinary Leadership. I’m also a professional musician and do a lot of dance and theatre. And I have the most incredible dog in the world. 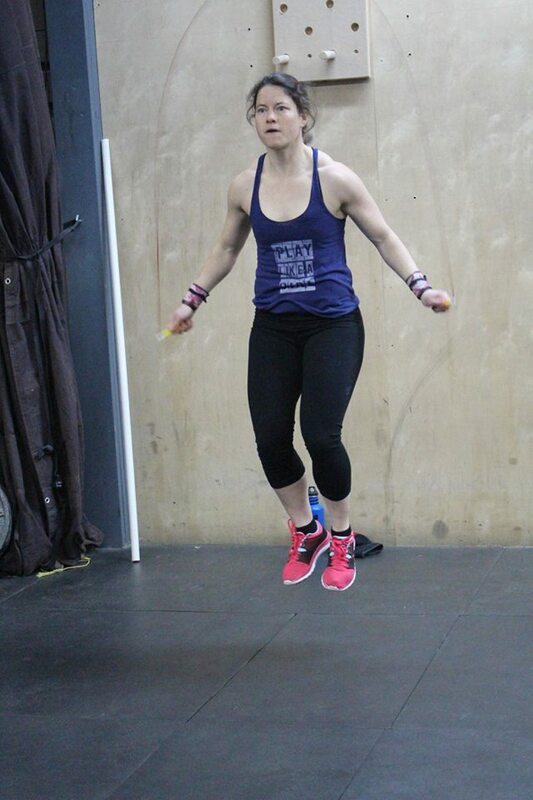 What do you like most about CrossFit: Constant variance – I’m never bored! And the amazing community. What drew you to CrossFit: I watched the Games on youtube for years and was always intrigued. In the summer of 2016 I got very sick with stress and complications from my diabetes and knew I needed something more physically challenging that would motivate me, so I Googled “CrossFit gyms in Prince George” and never looked back. How has CrossFit changed you? I am a stronger, more well-rounded, fitter athlete than I have ever been and I am far-less prone to injury. Why did you become a coach? Our gym needed female coaches, and I knew that I would want to coach eventually. I want to share the passion and joy and incredible results with others that CrossFit has brought to me.